Using a proven navigation convention and a consistent content design structure reassures your page’s visitor of where they are and will allow them to find the content they are looking for easily. Given the site information architecture diagram, develop a navigation plan for the web site. Specify the global and local navigation systems using the appropriate labels for the navigation items. Specify any courtesy, ad hoc, cross-links or other navigation that will appear on the web site. Identify a way to let users know where they are within the site. Identify the navigation for the mobile site. 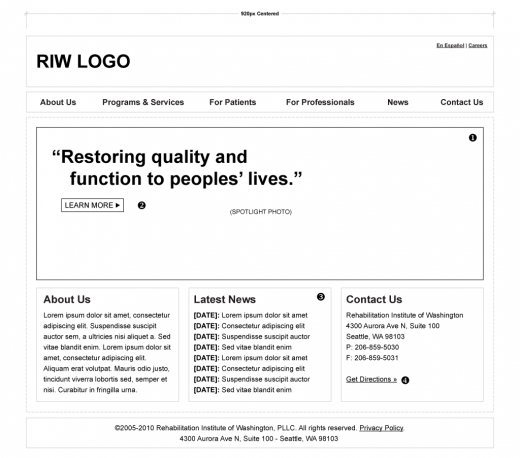 You will need to complete black-and-white or grayscale wireframes for your project website. You must complete six wireframes for project, one set as desktop and one set for mobile. The wireframes should be developed in Illustrator, Photoshop or Sketch (or another wireframe tool) and turned in per the class schedule. Share the URL in the appropriate section of our Slack group. MAKE SURE THE ELEMENTS ARE TO SCALE. pick a mobile device and wireframe goes inside this container. Indicate on the wireframe the OS/model chosen.